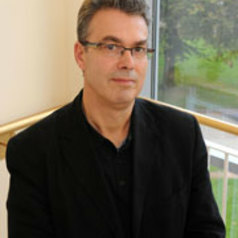 David Amigoni studied English and History at University College Cardiff, followed by an MA in Victorian Studies at Keele University. He obtained his PhD from the Liverpool Polytechnic which he later published as Victorian Biography in 1993. He has taught at Aberystwyth University and the University of Sunderland. He took up a lectureship at Keele University in 1995 and was promoted to senior lecturer in 2000, and then to a personal chair in Victorian Literature in 2005. He was elected Fellow of the English Association in 2008. He researches, broadly, the dynamic relationship literature and intellectual culture in the nineteenth century, on which he has published extensively, exploring, in particular, the relationship between evolutionary science and literature in the Victorian period: he published Colonies, Cults and Evolution with Cambridge University Press in 2007 (and funded by the AHRB). Since 2009 he has worked with Professor Miriam Bernard and the New Vic Theatre on a New Dynamics of Ageing funded project on the relationship between ageing and theatre; connected to this he has secured AHRC Network Funding, with Professor Gordon McMullan (King's College, London) for an interdisciplinary exploration of late-life creativity (an ongoing research project). He has occupied the managerial roles of Head of the School of English, Research Dean of Humanities, Director of the Research Institute of Humanities and (most recently) Head of the School of Humanities. He is a member of AHRC's Peer Review College.